Late summer concert season is in full swing, and between now and the end of October I’m going to be seeing an insane amount of bands come through the Baltimore/DC area. 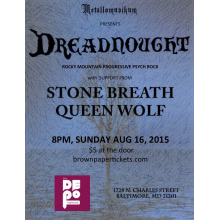 I can’t think of a better way to have started things off last week than a performance by Dreadnought, who recently put out what is easily one of the most interesting albums to come out in 2015. Bridging Realms further expanded on the band’s ability to merge sweeping and adventurous progressive/post rock with harsher vocals and sludge/black metal sections, and I was excited to see how it would transfer over to a live setting. There were two openers to start the night off, the first of which was Baltimore natives Queen Wolf. Though they’ve been around since 2012, I had seen the name before but hadn’t had the chance to give them a proper listen. On their social media profiles the band describes themselves as “loud guitar music” and this seems like an appropriate description as the guitar work definitely drove the songs forward with a definite sense of urgency and instantly grabbed my attention as the set began. Stylistically Queen Wolf is one of those groups that jumps all over the place and is hard to pin down into a specific genre, which works in their favor. One moment the instrumentals are flying by at a fast pace with technical riffing and regular shifts that have a progressive/math rock with a slight metal edge, while the next they’ve slowed things down considerably and the riffs have settled into a blues rock/classic rock ‘n roll feel. It’s the type of mix that seemed to always have something new to offer with each song in the set, and over top of this constantly shifting instrumentation Sarah Gretchen let her voice completely soar. Gretchen has that type of pitch that’s perfectly suited to loud rock music of any variant, as she would often start off at a softer range and let her singing build naturally with the music until it had hit an almost overwhelming point. In between the songs every member of the band was joking with the audience and had presence, and it was an enjoyable performance that left me interested in looking further into what Queen Wolf has to offer. I say this in most of my reviews, but it continues to be apparent just how much musical talent Baltimore talent houses considering that I seem to find another local band that impresses on almost every show I write up and I’ve already covered so many. Pennsylvania folk group Stone Breath was the next band to perform, and I was excited to see them again. The first time I had seen them play was at a private house party on New Year’s Day, and I was captivated by the earthier tonality and gruffer singing voice that Timothy Renner brought to the performance. This particular set encompassed quite a bit of the material that I remembered from their set at the beginning of the year, but this wasn’t a bad thing as it was just as engaging the second time around. For the uninitiated, Stone Breath has been around since 1995 with Renner as its primary contributor and right now he has two others backing him up on guitar and acoustic bass. With the softer instrumentation a good amount of the audience chose to sit on the floor of the venue and soak everything in, and while bands of this type can sometimes be disrupted by a noisy bar in the background everyone present seemed to be interested in what was happening in front of them and let the music fill the venue without any distractions. I’ve always been intrigued by folk that has mystical flair to it, and when listening to Stone Breath both on record and in person there is plenty of that both in the airier melodies and Renner’s storytelling lyrical style. Folk can be a tricky genre to pull off, as its minimalist style can lead to repetition, but every song that this group had to offer felt different from the last and the warmer and inviting atmosphere made it truly enjoyable to watch. The next time I will get to see Stone Breath will be at Shadow Woods Metal Fest, and I think the camping atmosphere will be perfectly suited for their psychedelic/dark folk sound that channels elements of both the familiar and unknown into a truly compelling blend. Both openers were fantastic and brought a very different range of musical styles with them, which seemed like a perfect fit for Dreadnought’s music. As the majority of the band’s songs skew towards the longer side, they chose to play two from Bridging Realms and two from their 2013 debut Lifewoven. Dreadnought had instantly captured my attention on their new album with soft keyboard and guitar work that built up in a manner that suggested a progressive rock framework, but then completely opened up into harsher instrumentation and abrasive vocals. These elements were amplified in a live setting, and every element that had me entranced on record was downright jaw dropping in person. I knew that guitarist Kelly Schilling also played the flute, but was unaware that drummer Jordan Clancy was also their saxophone player. My attention tended to fall towards him as he would have to grab his saxophone and prep it in the middle of drumming, which I’m willing to bet takes some coordination. The instrumentation sounded even better live, as having both the jazzier and progressive melodies fully wash over you as the band played was mesmerizing, and Schilling’s harsh screams cut through the sound with a jagged edge and was even more menacing than on record. It’s evident that in their three years together as a band the members of Dreadnought have really become a cohesive entity, as each of the four plays off the other perfectly and despite the complexity and length of their arrangements they perform all of them flawlessly. I always know that I’m watching a truly engaging live performance when ten plus minute songs have me so captivated that they felt like they went by in a matter of seconds, and this is exactly what this group was able to provide on this particular evening. There’s a lot of potential for Dreadnought to appeal to a wide range of musical tastes, as despite heading into rougher metal territory the emphasis on sweeping melodies and ethereal clean singing from both Kelly Schilling and Lauren Vieira could grab listeners outside of the metal spectrum. Dreadnought exceeded my expectations and put on an engrossing performance that showcased material from both of their records, and I can’t wait for them to come back. Thanks to Mary and Metallomusikum for continuing to bring exciting acts like this out to Baltimore, and with the fall season approaching there is plenty for music fans in this area to look forward to.